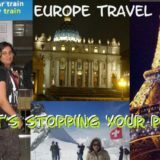 Are you making a connection from Paris to Barcelona for your Euro Trip? Are you planning to visit La Merce festival at Barcelona? Are you carrying luggage and wish to avoid flights for the extra charges? Are you unable to sleep through overnight 19 hrs bus journeys from Paris to Barcelona? Are you not comfortable taking overnight trains? Do you wish to make this connection in less than 10 hours that too in day time? 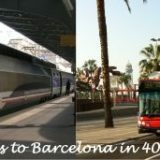 If your answer for all the above question is affirmative, read on my travel notes to make this budget connection from Paris to Barcelona in just 40 Euros. 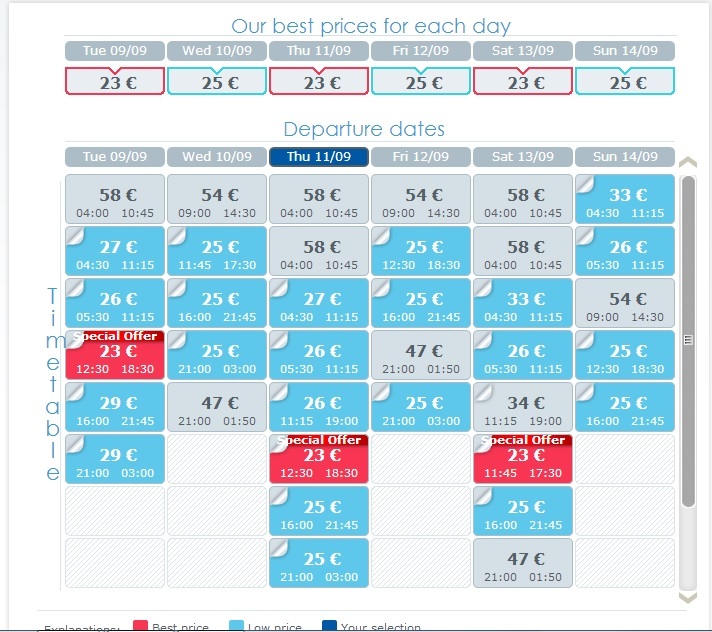 You may have to plan your itinerary accordingly to grab the cheapest fare of 10 euros. Further, you can add your baggage (similar to check-in baggage in flights) at rate of 5 euros per bag. Though, 20 euros for this connection is a cheap price too, I have described an alternate way to book this connection here. Important to Note : Presently, Ouigo website does not accept payment from non french credit card/ debit card presently, you may have to ask a friend or agent in France to do it. Also, you may need a french mobile number for booking. For those who do not wish to book through Ouigo, you may read this post. Step 3 : Travel from Montpellier St Roch Train station to Bus stop. The stop for most of the buses heading to Barcelona is located at Sabines tram station at a distance of 4 Km from Montpellier St Roch train station. Take a tram (Line 2) form Gare Saint Roch (Train station) to Sabines tram stop (for Bus). This line is indicated by orange line on map. 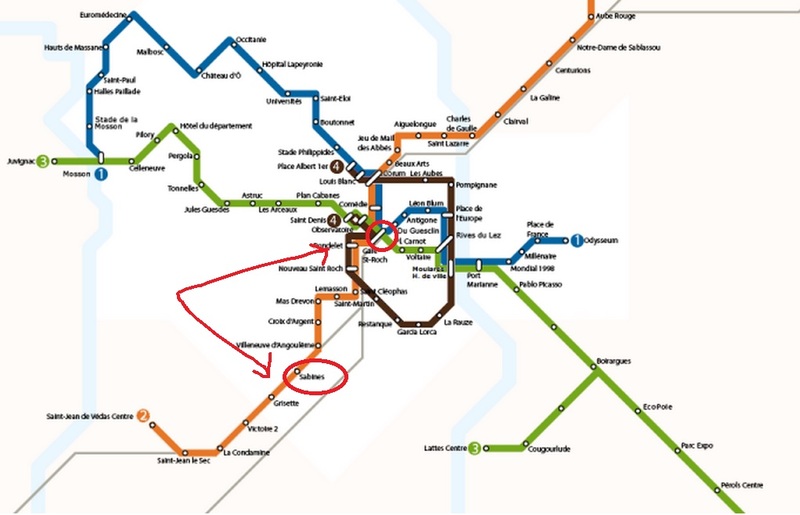 When we took this journey on Sep 19, 2014 of Eurolines Barcelona from Montpellier, We found it very difficult to locate the tram station at Montpellier St Roch Station towards Sabines station. There were four tram stops just outside the station. Most of the locals in Montpellier speak only french and thus, we were unable to ask directions from them. It took us a lot of time to identify the correct stop. We are adding a screenshot from Google Map here to help the readers locate the correct tram stop. I hope this will add to the convenience of travelers taking this route. No problem of luggage as faced with low cost airlines. You can visit Montpellier France for a day trip in between. Start and reach on the same day. 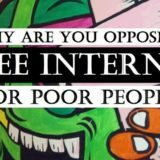 Did this find this post helpful? Please let us know your opinions through comments. 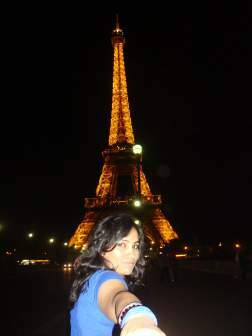 You may share this post on social networking sites to tell others about this budget connection from Paris to Barcelona. 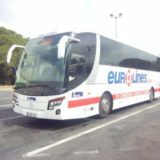 If you are using Eurolines Bus for your Euro Trip, Eurolines Pass might be a better option. But, is it really worth it? Read our Eurolines Pass review and take a better decision. Such a useful information. I have a few question to ask. Im planning a trip from paris to barcelona,cordoba and granada. 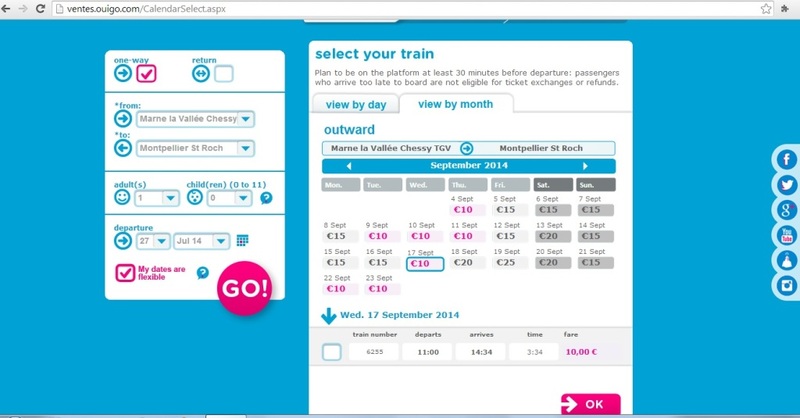 But from the website “capitainetrain.com” they gv me a route whereby i need to take train from gare de lyon to mtpellier st roch and then change to bus to barcelona in sabines station. 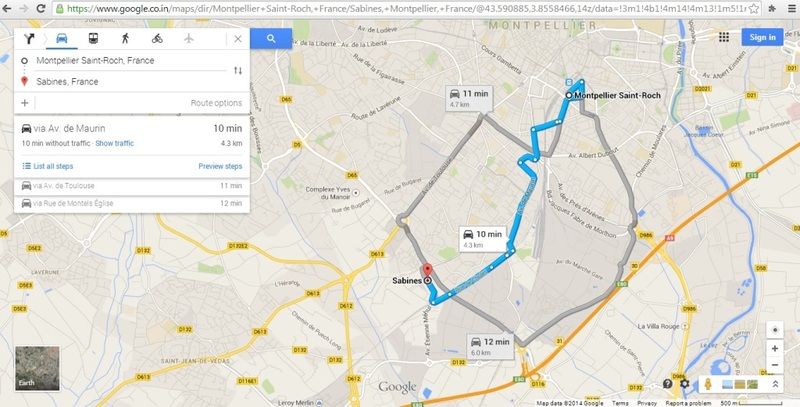 But the gap of time between mtpellier to sabines i only have 1.5 hours bfore the bus depart to barcelona. Do u think i will be able to make it?im from malaysia so im not really familiar with the route or train schedule. Hi Dila..We are so happy that our post has been useful to you. We have provided details for the connection from mt pellier to sabines. You will be able to make it in 1.5 hrs. It took us only twenty minutes to make it after we caught the tram. When you come out of the stations there are four tram stop stops and you have to identify line 2, orange line. I will try to drop a note to you on your email for exact directions. Actually, People in Montpellier speak only french. As we didn’t know french, it took us thirty minutes to identify the correct metro stop. Also, much people don’t know sabines there and we could not get any help from the locals. We read the large map and our blog post notes to identify the tram station. Trains are not generally late and I am sure you would make the connection. Let me know on this post once you have done it. Hi.. I have added the screenshot for finding correct tram station for Sabines at Montpellier St Roch Railway station. No issues Dila, You can contact us on our email.